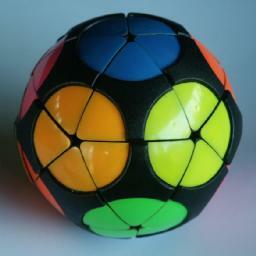 The Impossiball puzzle, also called the Incredi-ball, is a ball with 20 curved triangular pieces like an icosahedron. Each cap of 5 triangles rotates around a vertex. The vertices are coloured so that the pieces have three colours each. 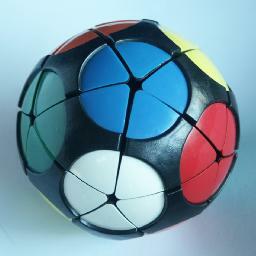 It is equivalent to a megaminx with only corners and no edges or centres. The Impossiball has only 6 colours, since opposite vertices are given the same colour. 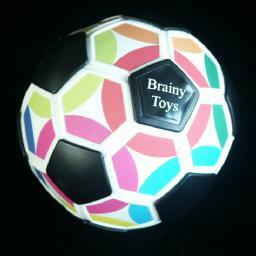 Therefore each piece has a mirror image on the other side of the solved ball. By lifting out any single piece, the Impossiball also becomes a sliding piece puzzle. The first version of the puzzle was by Milton Bradley, and its six colours are the same as the Rubik's Cube, i.e. white, yellow, orange, red, green and blue. Meffert currently still produces this puzzle, but that version has pink instead of white. The Impossiball was patented by William O. Gustafson on 2 October 1984, US 4,474,376. The Thomasball is essentially the same puzzle, but has a completely different mechanism. It is a sphere tiled like a football, but the pentagons are fixed, and raised slightly so that the other tiles (of which only a hexagonal part is visible) are kept in place underneath them. Each ring of 5 hexagons can rotate around their pentagon. The version shown here has twelve coloured circles, and is therefore completely equivalent to a twelve coloured Impossiball. Other colourings are also available, but they are all easier to solve due to their identical pieces. The Thomasball was patented by Zdenek Blazek and Miroslav Jandora on 13 February 2003, US 2003/030,212. There are other similar patents - a recent one by Nicky Djukic (DE 20,211,793-U, 2 Jan 2003, and WO 03/105,978, 24 Dec 2003), and also an older patent by Gilbert OberMair (DE 3,204,033, 25 Aug 1983). 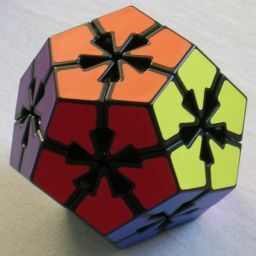 The Flowerminx is a dodecahedral version of this puzzle. In this version there is some space inside the pieces to allow the faces to rotate freely without having to lift up like with the impossiball. There are decorative openings in the pieces to show the space inside. This leaves 19!·318/2 = 23,563,902,142,421,896,679,424,000 or 2.4·1025 positions. Uwe Meffert's pages. He produces and sells many puzzles, including the Impossiball and the Flowerminx. Meffert's page Contains the solution provided in its booklet. Mark Sunter-Storey's site has a solution. Let F, R, D be three adjacent vertices (Front, Right and Down), in other words, F, R, D are vertices arranged clockwise around a piece. Let U (Up) be the other vertex adjacent to both F and R, and let L (Left) be the other vertex adjacent to F and D. Clockwise 1/5 twists of a face are denoted by the appropriate letter, anti-clockwise 1/5 twists by F', R', L', D' or U'. In the solution below, the pieces around the D vertex are usually still unsolved. Phase 1: Solve all but one vertex. Select any vertex to solve first, and any colour to place there. Find a piece belonging at the vertex which is not yet there. If there are no such pieces, and the vertex is not solved then displace an incorrectly placed piece at the vertex by choosing any unsolved piece. Hold the ball so that the piece belongs at URF, and such that D is unsolved. Use any moves that do not disturb already solved pieces to place the piece at DFR. These sequences only disturb the D vertex pieces, but nothing else except for the URF corner. Repeat a-d to solve all the pieces at the vertex. Be careful not place mirror image pieces together by mistake. Repeat the above for successive adjacent vertices until all but the final vertex is solved. Phase 2: Position the final pieces around their vertex. In this and the next phase, the vertices adjacent to the unsolved D vertex are in clockwise order: L, F, R, b, B.
Rotate D to place as many of its pieces in position as possible. Hold the puzzle so that one of the following sequences will position the pieces correctly. Phase 3: Orient the final pieces. Find a piece that needs to be twisted anti-clockwise and hold the puzzle so that it is at DFR. Find a piece that needs to be twisted clockwise, and do one of these sequences to solve it. 4. DFR->RDF, DRb->RbD: RU'R'F'U'F D' F'UFRUR' D To turn three corners in the same direction, just turn any two of them using the above, and then there will be only two unsolved corners, and one of the above sequences will solve them.